This chart covers the week commencing October 22nd to October 28th. It's interesting to note that all of the top ten channels this week belong to Twitch. Epic's official Fortnite channel is leading the charge this week with a massive 415 per cent increase in views. In second we have Dota1RuHub, a channel dedicated to Dota 2 coverage and a new entry this week. Third place is also a new entry; GamesDoneQuick has smashed in to third with a playthrough of Super Metroid. Battle royale pro Shroud is in sixth place after a 37 per cent drop in views, but Fortnite favourite Dakotaz is making his way up with a huge 104 per cent increase in views since last week. 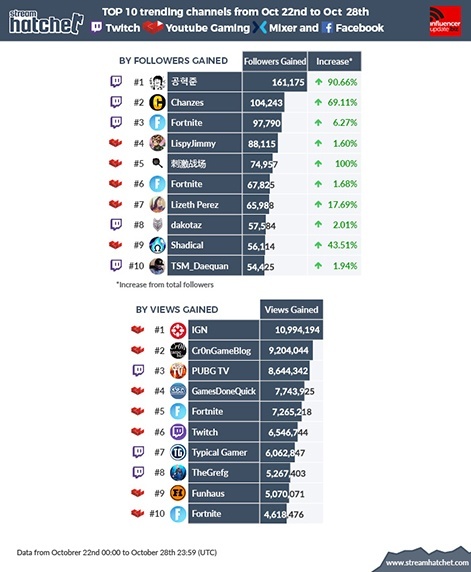 NICKMERCS is and TSM_Darquan have both experienced big leaps in views this week, with 127 per cent and 178 per cent increases respectively. LIRIK (main image) is a new entry to the chart this week, coming in at number 10 with an 163 per cent increase in views. Looks like his fanbase are enjoying Red Dead Redemption 2. Unlike the above chart, this one is a perfect balance of Twitch and YouTube Gaming channels. However, the majority of these creators are still Fortnite centric. 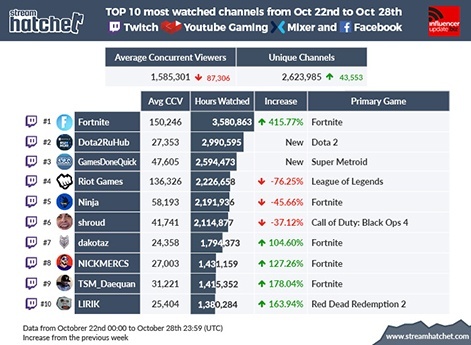 In fact, Fortnite's official YouTube and Twitch channels are both in the chart. 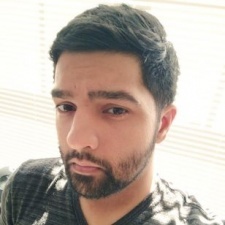 New entries this week include Twitch channel Chanzes, which mainly broadcasts Fortnite, and Mexican YouTuber Lizeth Perez, who is growing rapidly with coverage of mobile battle royale Free Fire. A surprise entry from IGN takes the top spot on the views chart this week. The video games outlet racked up a huge 10.9 million views on its YouTube channel. Other entries include YouTuber channels Cr0nGameBlog and GamesDoneQuick. Twitch's official Twitch channel is also in this week's chart down to its coverage of TwitchCon this weekend.